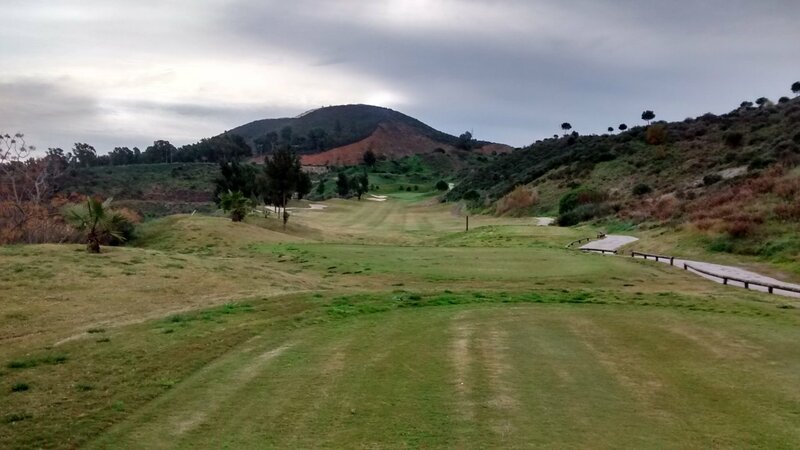 A course unlike most others on the Costa del Sol. Not expensive to play, the temporary clubhouse is small and simple, boxy construction. They plan to build a new bigger clubhouse during 2015. Nice view down the valley and service/food OK. But not luxurious by any means. I do not particularly care, because the course is more important to me than the clubhouse. You can not easily walk this course – they normally insist you take a buggy. There is a good reason for this. Calanova is very up-and-down in a valley – nowhere near the small strip of coastal plain. The course also covers quite a large area, with some long (and steep) distances between holes. If you walked, it would add about 1 hour to your round. The rough here can be very tough – you can lose a ball a few meters off the fairway and 5 meters off the fairway you might not even get to if you want to look for the ball. 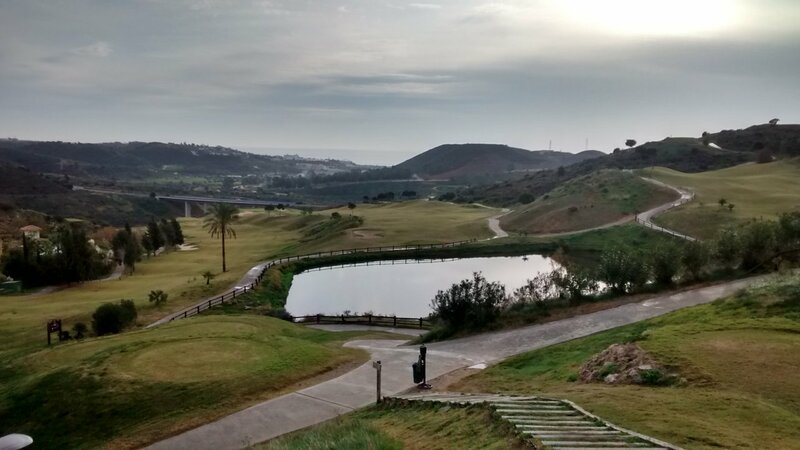 Therefore a number of factors make this a tricky, difficult course – steepness, wild rough, holes with sharp turns following the landscape (the shape of some holes follows natural contours). Some players view this as a down-market course – the combination of clubhouse and course is below a minimum standard for some people. I do not agree fully with that. I do like the course as a different experience from all others. Sure Calanova is quite tough and on a windy day can be really difficult. But each hole is different and the course is quite beautiful in its own way - if you appreciate the environment you are in as I do, and like a course that has some good views, is not just flat and dull. Definitely one that you need to play a few times to understand the quirks on each hole. One that I will not recommend to high-handicappers unless they have a lot of patience and can keep the ball straight. Here keeping the ball on the fairway is much more important than length if you are not a good golfer and want to avoid losing a lot of golf balls. For me as a mid-handicap golfer, it is very easy to walk off the course with 5 or 6 holes where I have 'blobs' (no Stableford score whatsover). Calanova changed ownership in 2014. It had some investment in areas where it was needed. All new electric buggies to start with. The greens are also now good. Quite large and only a few small muddy/sandy patches on the greens that otherwise are good quality. Medium-fast and often sloped, so the line of the putt determines the speed of the putt (otherwise you miss the hole completely and can easily end up with another putt of several meters). The fringes around the greens (up to 2 meters off the green) are soft grass that is easy to pitch off. The bunkers are also good quality – well shaped and well maintained. The fairways are reasonable as well. No obvious problems with unrepaired divots, and the fairway grass is good quality for a course at this price level. In summary, Calanova is an unusual course that provokes mixed feelings. Some people – including me – appreciate it for what it is. To me, an interesting course if I am hitting the ball straight and it is not a windy day. Not a course I play regularly, but one I can go back to any time without hesitation. It is an unusual course, but that is no bad thing. Above all else, this is definitely not a boring course. I like that. The staff on this course are doing the best they can in a friendly way. You can not ask for more than that. Review last updated: February 2015. Number of times played: 10. Calanova is represented by the yellow dot. 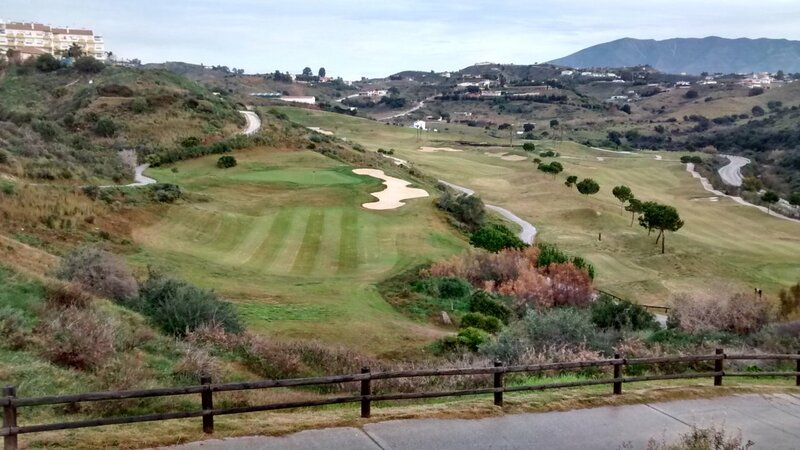 This shows that the course is slightly longer and more difficult than most other courses on the Costa del Sol. An 18-handicap player can expect to go around this course between 20 and 21 over par.